From "Will You Marry Me?" to "I Do!" This package is perfect for couples who want assistance through the entire wedding planning process. We will hand-pick the right vendors for you, handle vendor payments and all the small details that tend to become after-thoughts amidst the wedding bliss. You will also receive a complimentary facial or massage from our favorite boutique in San Diego to take you further into relaxation during planning. This package includes coverage for the entire month leading up to your wedding day. Imagine a spell check for your wedding, we help make sure that there are no unwanted surprises that could happen on your big day. We also help you tie up loose ends yet to be finalized with vendors and more. ceremony/reception set up and break down. This package is designed specifically for those having a vow renewal ceremony and/or reception. Pricing is based on individual's needs for coverage. Please contact us for a custom price quote. 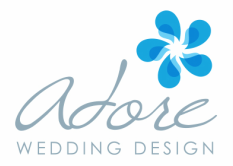 Adore Wedding design specializes in the artful composition of your entire event. Our professionals will discuss with you about your style preferences and interests to help you choose a theme, a color pallette and wedding style. Everything from Linens, favors, centerpieces and accessories will be selected with careful detail so that we can create a look that is whole, beautiful and a reflection of you. Add design services to your package. *Must be contracted for design 6 months before wedding date. If you have the planning under control and just want to hire our creative services, no problem! We include an initial consultation to talk in detail about your wedding, your vision and your style. We will bounce around ideas and then afterwards, get to work on your design. We create a vision board for you and include two other meetings to discuss and tweak until it's absolutely perfect. Every design is different so please contact us for pricing. See some examples of our designs in our portfolio and our blog! Need to make acommodations for out of town guests? We can reserve room blocks for you within close proximity to your venue. Please inquire for details and a customized quote for any of the events listed below. a charge of $1 per mile roundtrip will apply. Mile calculation starts once outside of our regular business radius. Reach out to us and see if we can help you!